If you want to be remembered, you have to be different from the rest. IASO provides a range of products that helps businesses to stand out from the rest. The lighting valance is an example of this, developed by the R+D department at IASO. The main aim and function of the lighting valance is to act as an advertising claim as well as to create an element that is both differentiating and attractive for the client’s establishment. 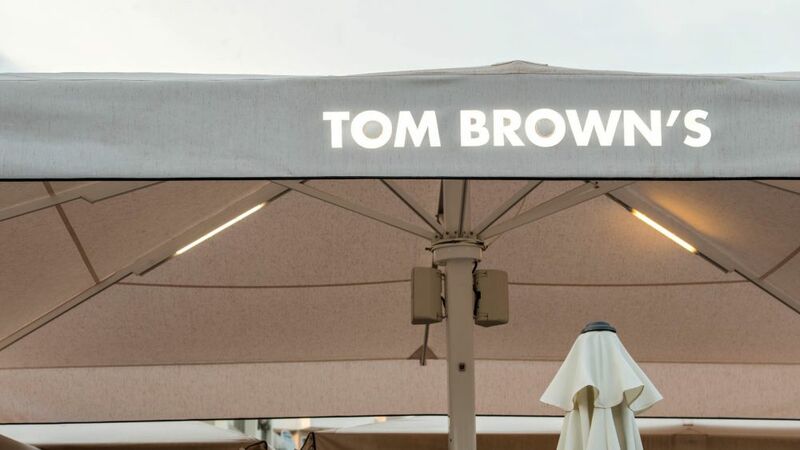 The name of the business is incorporated into the awning or parasol in the form of LED lighting. This is a customizable product and it's excellent for providing visibility to a premises, restaurant, or any other type of space that wants to stand out. The lighting valance is a product that has been designed for use on awnings or parasols. This consists of an LED technology board that is inserted into it. It has a low voltage transformer that permits good light flow so that the design or text is visible from short and long distances, during the day and at night. There are different panel sizes for this product: a large LED panel of 1200x300 mm and a small LED panel of 300x300 mm. Combining these two elements permits the configuration of a wide variety of designs and prints, as well as keeping electricity use to a minimum. Appeal, versatility, distinction and innovation are the four qualities of an establishment that use a lighting valance.